The face of the launch campaign is Marie de Villepin, the daughter of French Prime Minister Dominique de Villepin. There are 52 reviews of Ange ou Démon. A gorgeous and strong gourmand opening, then a fruity dry-down. A reverse fragrance. I wish it stayed stronger for a longer time. Amazing perfume. deep and sweet. great longevity and sillage. A mandarin note in the opening blends well with a light and gentle saffron note, that is much less intensive than e.g. in Sultan Safran by Comptoir Sud Pacifique, which was a regular of mine for some time. The drydown is flowery, with a pleasant orchid impression combining with a lily note. So far it is a pleasant composition, but the base with its wood and vanilla is quite generic on my skin, albeit never too sweet. I may be coming onto this fragrance too late in the game. I'm having problems finding the distinction in this from many an oriental gourmand. It's been done many times before. Or is it many times since? And I wish I could glimpse the angel and it's shadow, the demon. I envisioned a frosty cool, achingly beautiful lily/orchid, set high above a beastly, hot counterpoint of darkness below it. But it really isn't a fragrance like that at all. The angel, from the smell of it, is another homage to Angel... sigh. Sometimes fragrances can be so deriviative. This is more bearable than Angel, but it’s hard to find the wickedly sensual in vanilla, orange and herb. But what it is... If I take away my expectations, it is a midtone, modulated, richly vanillic cool floral gourmand. I'm not attracted to this style, so I'm having problems being fair to it. Except I really don't have to. All I know is that on my skin this doesn't shine or become sultry, become a delicious fragrance, all the things others say about it. I can't feel anything more than ambivalence. I will pass, and look for one that has a little more sensuality and floral and less vanilla and orange. First Factor attracted me to this was The Wonderful heavy Crystal Bottle so i expected a Mysterious or Magical scent but when i Tried it,I found that The bottle have Artistry!ANGE OU DEMON smells Nice but not Unique. in other words Sultry,Oriental,Feminine,Warm, Modern,Hypnotic and Seductive. ANGE OU DEMON by GIVENCHY is notes the Essence of seductive femininity that is effortlessly charming impressive and enticing.It opens with fresh notes then quickly reveals it is a warm feminine Scent by Floral heart as it is uplifiting.Vanilla in the base notes makes it Sweet. Tottaly it is Not too strong and not too mild for me.A Ladylike Perfume but in a Seductive Way. Perfect for a Modern lady,a lady who reveals the subtlest hint of Emotion.it is not for a Shy Character and Without doubt is seemly for Special Occasions in Winter Eveninigs. While out walking a canine friend one spring morning, flowers bursting all over the neighborhood, I thought, "Man all these flowers smell amazing!" I quickly realized that incredible burst of florals was actually the Ange ou Demon emanating from my wrist. Wow! I had it applied only a small amount to one wrist to test, and already this scent was wafting around me. It is, indeed, incredibly sweet. But also spicy and exotic. The mandarin orange gives it a little punch, and the florals are dreamy and just dripping with sweet vanilla. The woody notes really anchor it and provide that notable sensuality/maturity. 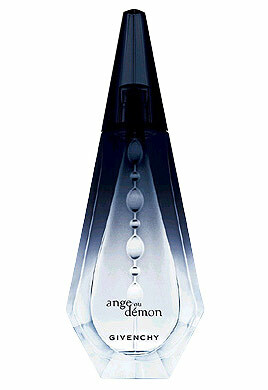 What a perfect name "Ange ou Demon" (Angel or Devil) - it's so versatile. It seems to perfectly conform to how you decide to wear it. A playful, sweet and feminine daytime fragrance? Sure! A seductive (perhaps naughty) nighttime perfume? Absolutely! It's a complex and spellbinding chameleon of a scent. I disagree that it's strictly a cold-weather scent. I'd wear this any time of the day, any time of the year, it's incredible! Long lasting with incredible sillage, too. There are no member images of Ange ou Démon yet. Why not be the first? Givenchy's ange ou démon le secret, for a man? I want the new Givenchy Ange ou Demon now!